My wife and I sat at a sushi place, our rolls ordered, waiting. Complimentary edamame came to the table. It was your standard edamame, cold and unseasoned, a little pale. Adequate but unremarkable. As we popped open the pods with our mouths and discarded the empty shells on the plate, my wife remarked, "I miss the garlic edamame at Sushiya." It was the sushi place she frequented when she lived in San Diego. Not recalling it specifically, I asked her to describe it to me so I could try to replicate it for her at home. "Garlicky, served warm," she offered. I purchased a 10-ounce bag of frozen edamame at the market and thawed it briefly in cold water. I made quick work of mincing some garlic and heating up a pan, swirled with sesame oil. This recipe is quick — four ingredients and just a few minutes in a hot skillet. The result is a steamy plate of edamame, glistening with oil and sprinkled with sea salt. We kept going back for more until they disappeared. 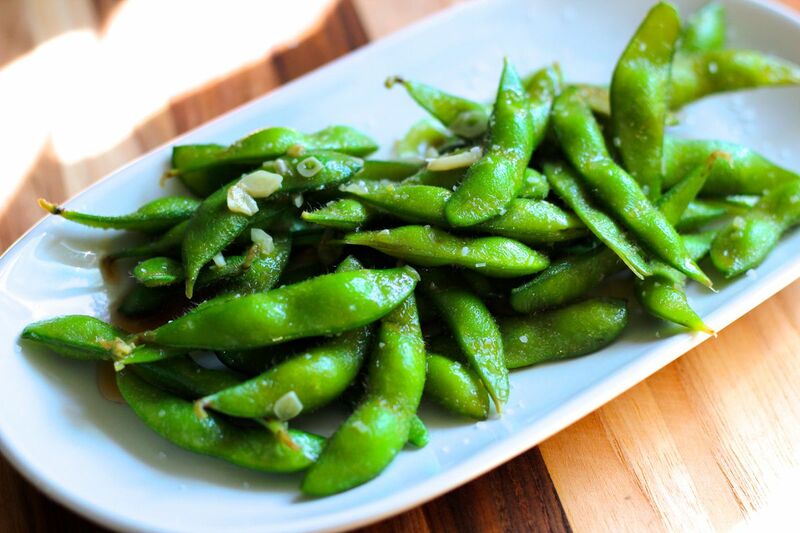 One cup of edamame is 13 grams of protein, so it's also quite a healthy and irresistible snack or side dish. To make it a little spicy, add a few drops of hot sesame oil to the toasted sesame oil in the pan. Heat a large skillet over medium high heat. Add the sesame oil to the pan. Stir in the garlic, sautéing just briefly, about 30 seconds, being careful not to brown. Add the edamame to the pan. Stir-fry the edamame until bright green and heated through, about 3 minutes. Transfer the edamame and garlic to a serving plate and season generously with coarse kosher salt or sea salt. Eat with your fingers.